Voters in Florida, Arizona, and Oklahoma head to the polls tonight, and Breitbart News will have live updates throughout the evening. 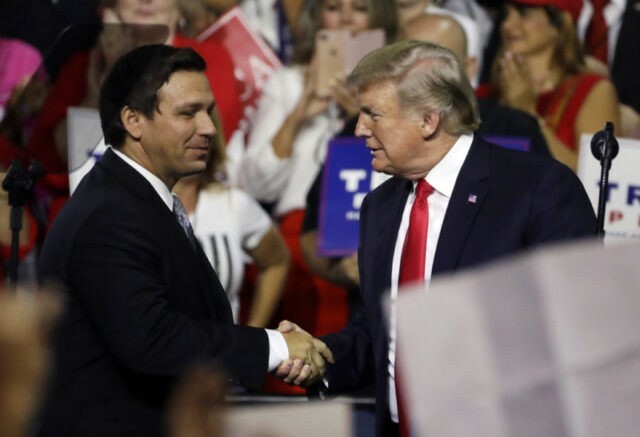 In Florida, Rep. Ron DeSantis, whom President Donald Trump endorsed, and Adam Putnam will seek the GOP’s gubernatorial nomination in a contest that could again show how important Trump’s endorsement is in a GOP primary. In Arizona, days after Sen. John McCain’s passing, Martha McSally, Kelli Ward, and Joe Arpaio are seeking to win the GOP Senate nomination for retiring Sen. Jeff Flake’s seat. Stay tuned to Breitbart News for live updates of all the important races on both sides of the aisle. All times eastern. Martha McSally, running in the Arizona Primary for U.S. Senate, was endorsed by rejected Senator Jeff Flake….and turned it down – a first! Now Martha, a great U.S. Military fighter jet pilot and highly respected member of Congress, WINS BIG. Congratulations, and on to November! Mike Pence just publicly congratulated Martha McSally for winning the #AZSen GOP primary. None of the ballot counts have been announced in that race. 10 PM: Polls closed in Arizona. Election results will come in at 11 PM ET. 9:17 PM: AP calls race for Gillum. TALLAHASSEE, Fla. (AP) _ Tallahassee Mayor Andrew Gillum wins crowded Florida Democratic primary, could become state's first black governor. Such a fantastic win for Ron DeSantis and the people of the Great State of Florida. Ron will be a fantastic Governor. On to November! 9:10 PM: Looks like Gillum, hoping to become Florida’s first black governor, is going to win his party’s nomination. Left-wing reporters, activists, and MSNBC getting excited. 9:05 PM: In Oklahoma, Kevin Stitt leads Mick Cornett 55%-45% with 47% reporting. The way this Governor runoff goes will be a good indication of where Oklahoma stands politically. Stitt has strongly aligned himself with Trump and electing outsiders into office. 8:50 PM: None other than Donna Shalala, the former head of the Clinton Foundation, is projected to take on Maria Elvira Salazar for retiring Rep. Ileana Ros-Lehtinen’s (R-FL) seat. Projection: it's Donna Shalala (D) vs. Maria Elvira Salazar (R) for open #FL27 in November. @CookPolitical rating: Lean D.
Governor Rick Scott officially wins the GOP Senate nomination. Scott, who leads by 6 points in the latest poll and has a slight lead in the RealClearPolitics average, will take on incumbent Sen. Bill Nelson (D-FL). Fox News has called the GOP gubernatorial primary for DeSantis–a huge win for Trump, whose endorsement propelled DeSantis into the lead. Flake hates Trump and Flake pushes for McSally. Speaks volumes. We can't send imposters to represent #AmericaFirst. We must #LeadRight. 7:20 PM: DeSantis (R) and Graham (D) with early leads in their respective gubernatorial primaries. Early-voting results have DeSantis with healthy lead on Putnam in Orange, Osceola. 7:15 PM: Democrats are trying to take back Florida’s governorship for the first time since 1994 and Tallahassee Mayor Andrew Gillum has an interesting mix of endorsements from the left as he makes a charge against frontrunner Gwen Graham, the daughter of the late Florida Senator. Gillum has been endorsed by Sen. Bernie Sanders (I-VT), who rails against billionaires influencing politics, and Julian Castro. But billionaires George Soros and Tom Steyer have been pouring in hundreds of thousands of dollars to boost the left-wing challenger. Celebrities like Diddy have also made last-minute endorsements. Thank you, @BernieSanders. Today is the day. 7 PM: Polls closed in most of Florida. Polls in the panhandle will close at 8 PM ET. Polls in Oklahoma close at 8 PM ET. Polls in Arizona close at 10 PM ET, though some polling places in Maricopa County could be open past 10 PM ET after voting machines were not set up at several polling places after a contractor failed to send enough technicians. 8/28/18 is Primary Election Day in Florida. Watch every single partisan vote that has been cast early and by mail, by date and location.